Click for the Post Show and the Race Analysis. 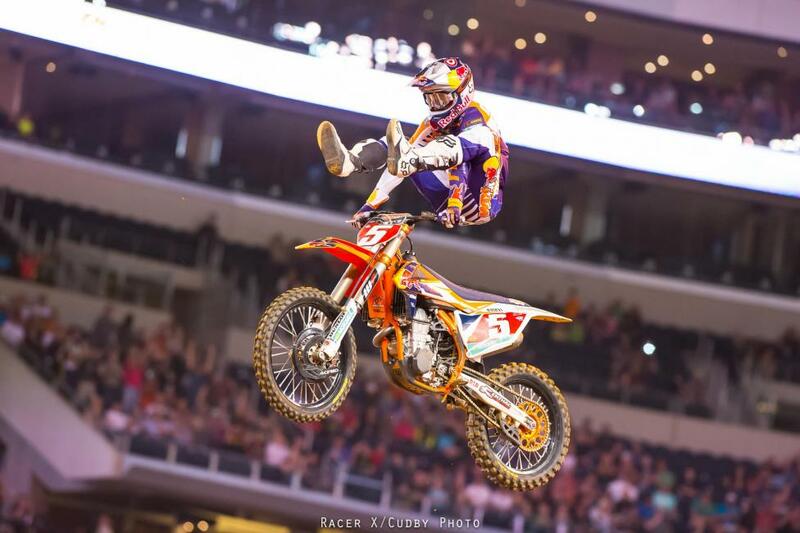 On this Valentine's Day in Arlington, Texas, Ryan Dungey and Marvin Musquin could only profess their love for their Red Bull KTM motorcycles, as the teammates led every lap of their respective 450 and 250 main events in Monster Energy Supercross. Even better, they both leave the event as the points leaders in their divisions, so they've got some nice red plates to go with a red heart box of chocolates. 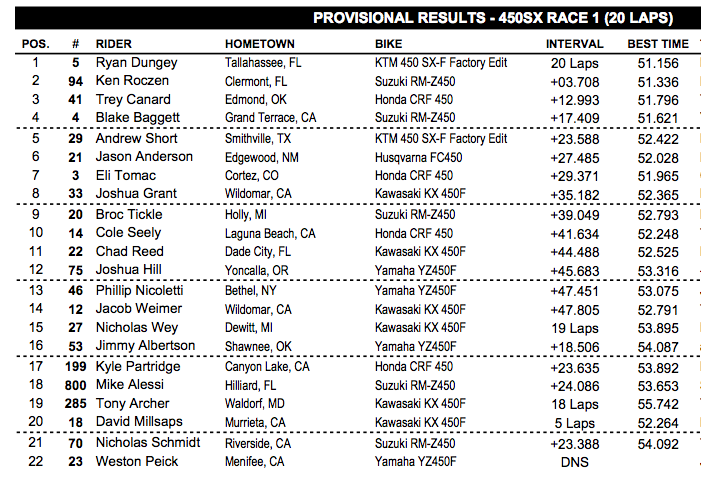 Dungey grabbed the holeshot, and .Davi Millsaps was second early on his Monster Energy Kawasaki. For the first two laps, Millsaps showed Dungey a wheel in spots. Then Dungey began to get away. Yoshimura Suzuki's Blake Baggett started third, but Ken Roczen was able to get past him for the spot and then go after Millsaps. Once Roczen got to second, he was about 2.5 seconds down on Dungey, and he went to work, closing in a small bit, but never getting close enough to put on any real pressure. Then Roczen made a bobble in a turn and couldn't nail one of the rhythm sections, and Dungey opened the gap back up to four seconds. It was over from there, with Dungey putting three more points on his lead over Roczen, bringing it to 11. "Wins are important. You're especially going to need them as we get towards the end of the season," said Dungey. "We're doing the best we can each week, putting ourselves in a good spot and we need to keep doing that. 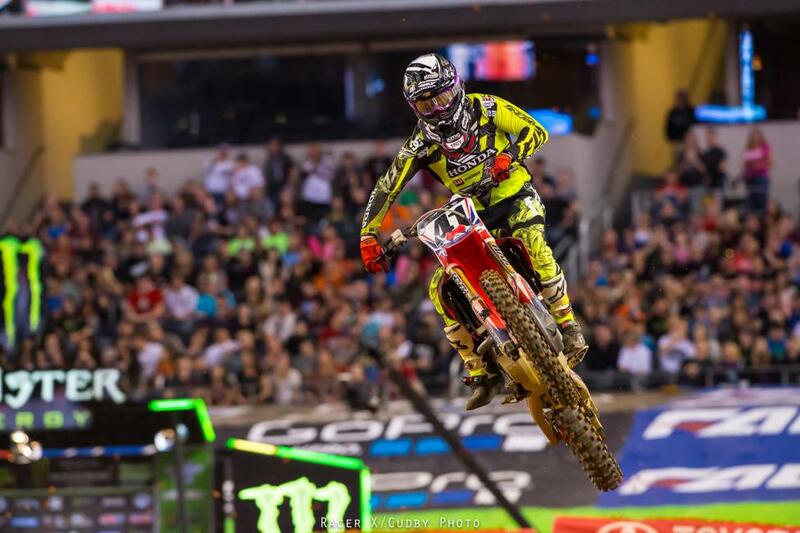 I got a good start tonight and was able to ride my own race." 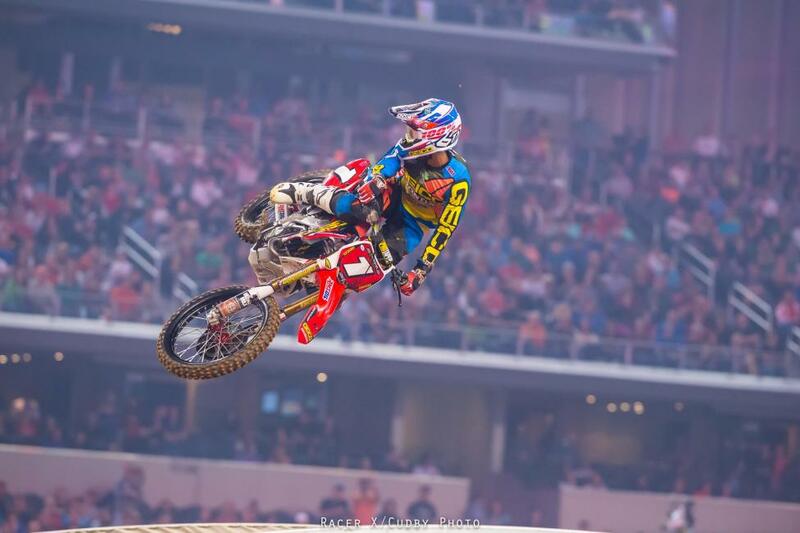 "It was tricky out there," said Roczen. "I got off to a decent start and made a small mistake early, but I'm happy with a second place. It's a long, hard season and the championship won't come easy." 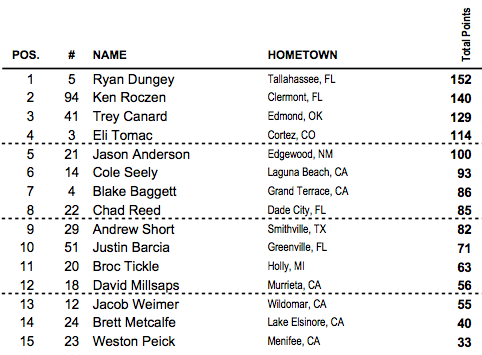 Behind them, Trey Canard got around Baggett and then closed on Millsaps. On the wall jump, Canard just barely touched Millsaps' rear wheel with his front, but Millsaps was in the air, and the slight contact was enough to make Millsaps' bike catch and loop out. Millsaps hit the ground and smacked his chin on the bars, his race was over. 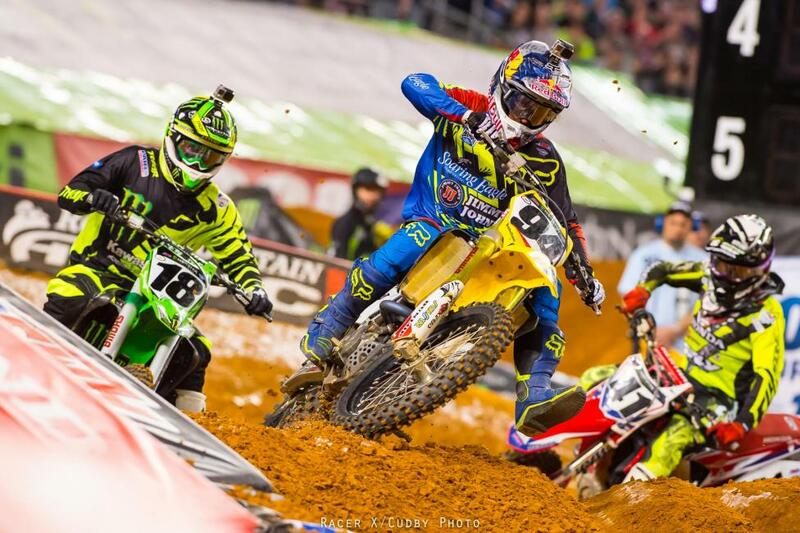 Canard took over third and held it to the end. Baggett took a career-best fourth, and Andrew Short logged his best finish of the year with fifth on his BTOSports.com KTM. Dungey now up by 12 over Roczen. Tomac had a bad start and a crash and lost more ground. Marvin Musquin's speed was not in doubt, he just needed a start to finish things off in the main event, and when he got it, it was over. He quickly pulled away from the field, but then Kyle Cunningham went down hard, and that brought out a red flag. Since half of the race had passed, they restarted the race with a staggered start, with the riders lined up in the previous running order on the start straight. 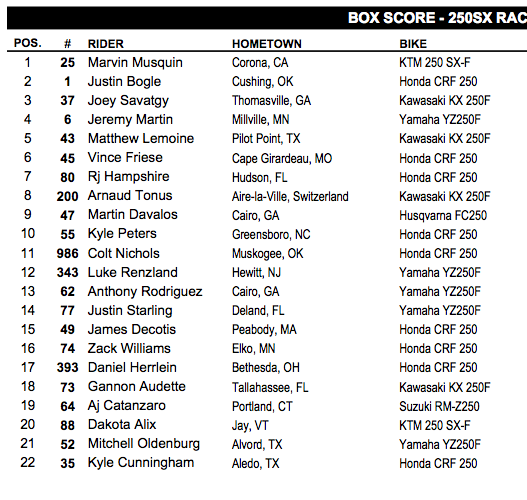 This put Musquin ahead of Justin Bogle, who was second on his GEICO Honda. Musquin pulled back away and Bogle rode solid for second. 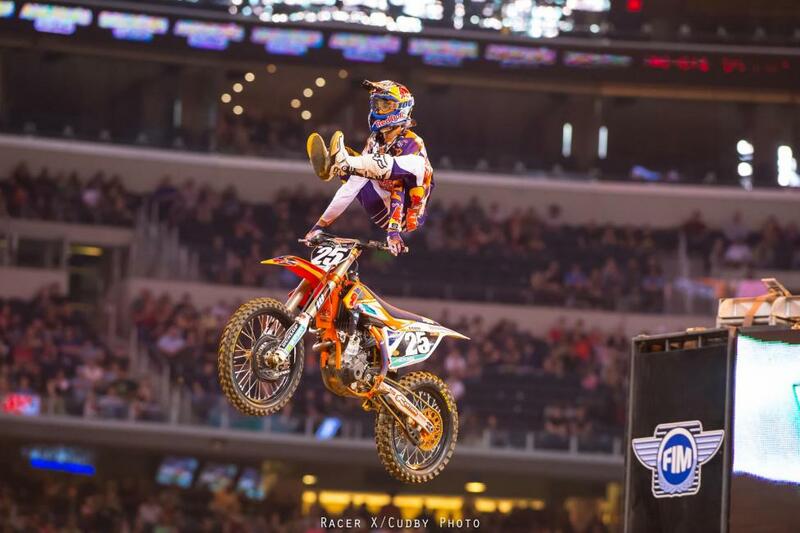 Musquin celebrated the win with a barrage of heel clickers. "I had a great start then I just did my laps and kept doing what I had to do," said Musquin, who missed all of last year's supercross season with an injury. "Just being consistent is what it's going to take and that's what I've been preparing for. I'm just happy to get it [a win] done this early, be here feeling good and healthy, and starting out strong." Then came the battle for the podium. Anthony Rodriguez fought and fought and fought to hold onto third on his Yamalube/Star Racing Yamaha, but Joey Savatgy finally busted past him to get to third on his Monster Energy Pro Circuit Kawasaki. Right behind came Jeremy Martin and Matt Lemoine, and they got A-Rod as well while they battled each other. After a few passes back and forth, Martin finally made it stick for fourth, with Lemoine fifth.